MUFF WIGGLER :: View topic - DIY module sale!!!!!!!!!!!!!!!!! My wife is giving me that "look" and I really need to be a little busier. Starting now, until midnight PDT Sunday, Aug 1, 2010, I'm putting my entire DIY series modules on sale. 1-4 modules, take 10% off. Shipping is $4.95 domestic, $13.50 international from the US for 1-4 modules. I can stuff 4 to a box. So, figure out how many boxes I'll need and calculate it accordingly. If you want it insured, add $3.00/box. They don't let me insure the international small flat-rate boxes. Be sure to email me and let me know what you need and include your MW username. BTW, I'll be demonstrating the QuAD/ ASR and Quad VCA along with other goodies tomorrow while I'm playing a guitar. Hopefully, I won't mess up too terribly. 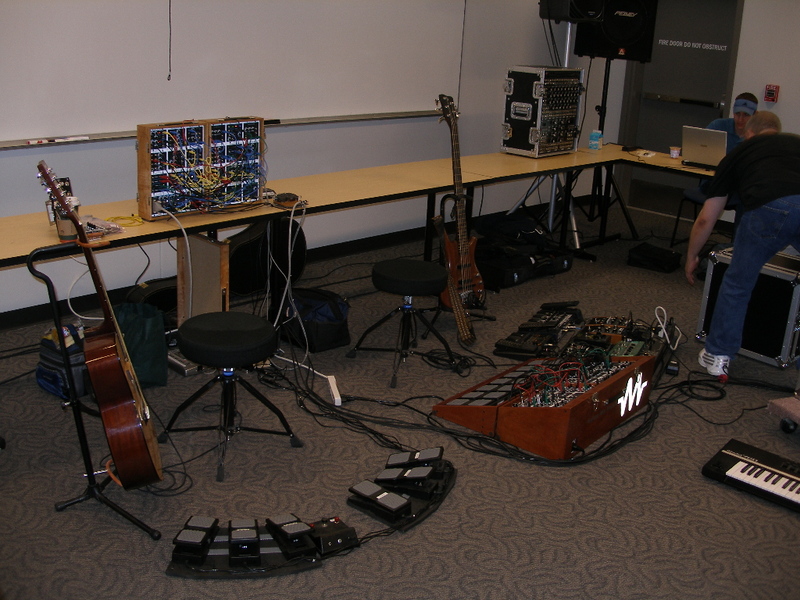 Keep an eye on Matrixsynth for his PNW 2010 posts. He may actually post a vid of it. You can play your geetar through my Behringer pedals! @computer controlled: It's an acoustic 12-string. Videos or it didn't happen! I forgot to turn on my 2 VCO drone that rumbles through the entire second half of the piece. After fumbling around trying to figure out why, I just continued. Figured it out right as I hit my closing chord and switched them in. Jason's stuff went without a hitch. Matrix will be posting the video and pix between today and throughout the week. Here's the only pic I took of my setup. JLR (John Rice) is in the middle of setting up his monster 5U system on the right side of the table. I only had my 2-cabinet MMM on the table. Everything else filled up the floor. I realised early this morning a) that you made diy modules, and b) that they can plug straight into euro... I almost ordered a diy filter straight away, but then realised i was a little bit worse off financially than I had thought.... and decided against it. Yeah, I don't get around to too many places. Welcome to the sub-forum. I like to treat these guys well. Great group! Matrix posted the vid of me fumbling around at PNW2010. I sent him an MP3 link that represents the way it's supposed to sound with the two VCO's turned on. All of the HandyCon controller modified those two VCO's and parts of the associated signal path so, all of the low end and fun stuff isn't in the vid. I guess it did happen after all. I dig that piece, nice work! I just thought I'd say what an absoloute pleasure it was doing business with George. Great customer service, and very prompt delivery! I can't wait to get working on my diy filter and probably a whole lot more down the track. Just a reminder that the sale will end at midnight Sunday (Aug 01) at midnight PDT. It was written for piano, though I'll never have the chops to play it on a keyboard. It could be a fun starting point for a sequencer, though. A guy on Matrixsynth told us and included a video of John Williams playing it. I didn't know he even played flamenco. I found my lesson notes. My instructor just wrote on the top "flamenco-easy" so, guess that wasn't much help. Even then, Segovia and Williams would have blown me out of the water. I usually just play for me. They don't get paid until Monday since the first fell on Sunday..today. To facilitate all of you who fall under this delema, I'll extend the sale to Wednesday, August 4. midnight PDT. Somebody figured out that if they order 5 boards, the 5th is essentially free. I'm just building boards today if any stragglers want to sneak an order in on the sale. Now, I have to get my tail to the September Chicago Trash Audio/ Xart synth meeting. Any suggestions for a sale this time?